Donatello created the spectacular bronze piece Judith and Holofernes near the end of his life and career. The piece was one of just a few completed after Donatello returned to Florence from Padua between 1457-1464. It was commissioned by the Medici family and meant to be a companion piece to Donatello's bronze David in the Palazzo Medici-Riccardi garden. Both pieces depict characters that slay tyrants, and both were freestanding statues that were can be viewed in the round. Judith and Holofernes was originally gilded and would have had an amazing reflective quality when viewed in the sunlight. To create this effect the bronze needed to be cast in eleven separate phases. 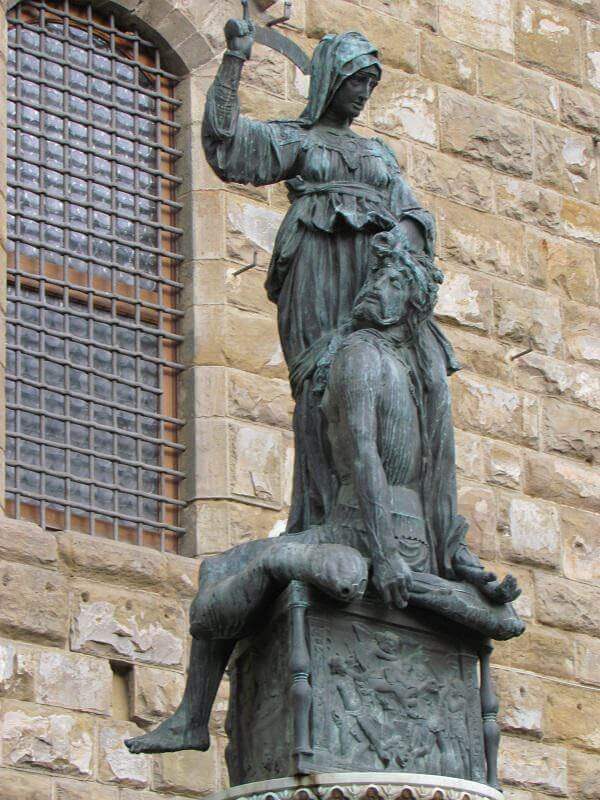 It seems likely that the Medici family commissioned the statue to be a metaphor of their rule in Florence. Judith represents the triumph of the strong over the weak as she stands holding slain Holofernes by the hair. The Medici family perceived themselves as defenders of freedom in Florence. An original inscription on the statue's pedestal detailed Piero Medici's dedication of the statue to "liberty and fortitude." The likeness of Judith is exceptional. She appears a consummate warrior with an irreverence to her task. The execution of the statue in the round and the attention to detail is a remarkable achievement. Today a copy stands on the Piazza della Signoria while the original is housed in the Palazzo Vecchio.